The vodka maker Grey Goose is now an official corporate sponsor of Virgin Galactic, a private spaceline that offers suborbital flights on its SpaceShipTwo spacecraft. Grey Goose celebrated the partnership with its raspberry-infused lightly peppered Beyond the Clouds cocktail seen here. When passengers riding with space tourism company Virgin Galactic arrive in the New Mexico desert to prepare for a space launch, they might just find themselves cooling their jets with expensive Grey Goose vodka. British billionaire Sir Richard Branson, the founder of Virgin Galactic, announced this week that Grey Goose is now a corporate sponsor for his commercial spaceline, promising that the exclusive vodka manufacturer will enrich an already exciting experience for private space travelers. Grey Goose is apparently ready to fly to new heights. Shown here is SpaceShipTwo during its first rocket-powered flight. Virgin Galactic has more than 700 reservations from future passengers — a list that includes such celebrities as Lady Gaga, Stephen Hawking and Angelina Jolie — who have paid as much as $250,000 each for a ride on SpaceShipTwo. Those participants will get to toast a new era of space travel with "exceptional signature cocktails," Virgin Galactic representatives wrote in the statement. SpaceShipTwo is designed to launch two pilots and six passengers on trips into space from a high-altitude carrier plane called WhiteKnightTwo. The winged spacecraft is not built to circle the Earth, but instead launch quick up-and-down flights into suborbital space. Passengers are expected to get a chance to climb out of their seats and fully experience a few minutes of weightlessness during the spaceflight. They'll also be treated to a rare view of the curvature of Earth against the backdrop of black space. The entire experience, from ground takeoff to landing, is expected to last about 2.5 hours. 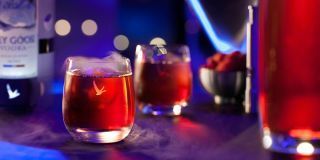 It's not entirely clear what the partnership will mean, but Grey Goose will apparently offer "a range of out-of-this-world experiences, exclusive content and a series of limited edition promotions," according to the statement. The vodka maker will also have "exclusive sponsorship activity" at Spaceport America, the new private spaceflight hub in New Mexico that lists Virgin Galactic as its anchor tenant. Virgin Galactic has performed several powered tests of SpaceShipTwo and had hoped to make its first official flight (with Branson and his family on board) by the end of this year. But now the company is targeting a 2015 launch for its commercial program. "It took us a lot longer to build rockets that we felt completely comfortable with," Branson told Bloomberg Television Tuesday (Sept. 23). "I'm confident that we're as good as there now. We've got some more test flights to go, but I think you'll start seeing Virgin going into space by the end of this year and then starting the whole space program in the spring." The corporate sponsorship with Grey Goose is not the first partnership for Virgin Galactic this month. In early September, Virgin Galactic unveiled a partnership with the sport utility vehicle manufacturer Land Rover in a contest for flights aboard SpaceShipTwo.